In many areas of business it has been observed that complacency kills creativity. Partly because success leads to lethargy and overconfidence it leads a firm to protect the causes of its success – mainly its current products. But nothing lasts forever and products and processes in service businesses have a life-span. In the technology world change is constant and only protecting your current product is a formula for disaster. Specifically, in the service industries every part of our ordinary world is being touched by mobile technology and data. We get things more efficiently than ever before and it has changed our perception of value. Clunky processes cause us to make judgments about the value of what we buy. In part the “how” is becoming more integral to the “what”. It’s a difficult thing to take on board in markets where change has been traditionally incremental rather than seismic. Companies understandably feel uncomfortable about the need to cannibalise their own processes. But it is in part because change is coming so fast and new technologies are developing so quickly that if we do not get our houses in order, it’s a fair bet that someone else will do it for us or simply knock them down. Just as Apple introduced the iPhone and cannibalised the iPod, it takes vision and commitment to change a market. But while Kodak had most of the patents for the digital-photography technology, it allowed other firms to license that technology and commercialise it. Kodak couldn’t make that switch from a culture of film to a culture of digital technology because it was afraid of cannibalising revenues. 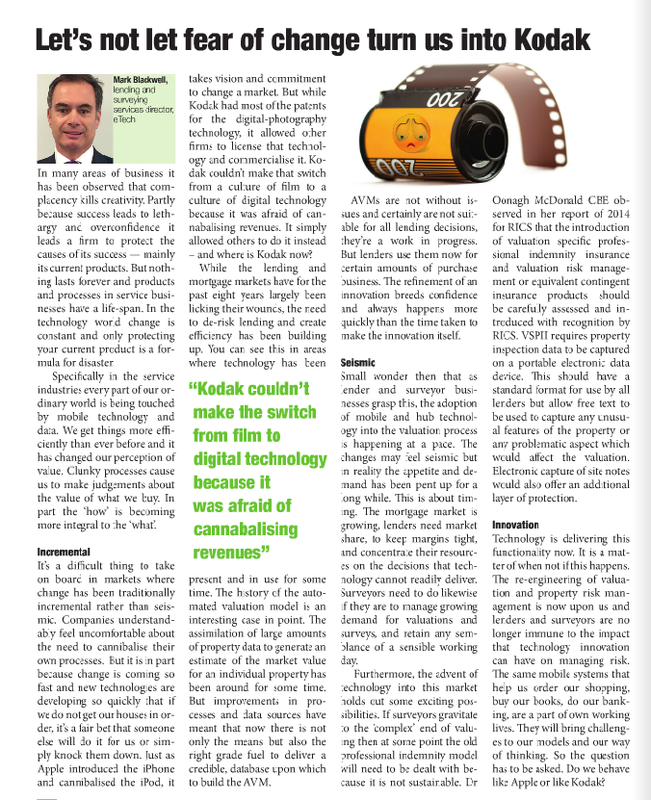 It simply allowed others to do it instead – and where is Kodak now? While the lending and mortgage markets have for the past eight years largely been licking their wounds, the need to de-risk lending and create efficiency has been building up. You can see this in areas where technology has been present and in use for some time. The history of the automated valuation model is an interesting case in point. The assimilation of large amounts of property data to generate an estimate of the market value for an individual property has been around for some time. But improvements in processes and data sources have meant that now there is not only the means but also the right grade fuel to deliver a credible, database upon which to build the AVM. AVMs are not without issues and certainly are not suitable for all lending decisions, they’re a work in progress. But lenders use them now for certain amounts of purchase business. The refinement of an innovation breeds confidence and always happens more quickly than the time taken to make the innovation itself. Small wonder then that as lender and surveyor businesses grasp this, the adoption of mobile and hub technology into the valuation process is happening at a pace. The changes may feel seismic but in reality the appetite and demand has been pent up for a long while. This is about timing. The mortgage market is growing, lenders need market share, to keep margins tight, and concentrate their resources on the decisions that technology cannot readily deliver. Surveyors need to do likewise if they are to manage growing demand for valuations and surveys, and retain any resemblance of a sensible working day. Furthermore, the advent of technology into this market holds out some exciting possibilities. If surveyors gravitate to the “complex” end of valuing, then at some point the old professional indemnity model will need to be dealt with because it is not sustainable. Dr Oonagh McDonald CBE observed in her report of 2014 for RICS that the introduction of valuation specific professional indemnity insurance and valuation risk management or equivalent contingent insurance products should be carefully assessed and introduced with recognition by RICS. VSPII required property inspection data to be captured on a portable electronic data device. This should have a standard format for use by all lenders but allow free text to be used to capture any unusual features of the property or any problematic aspect which would affect the valuation. Electronic capture of site notes would also offer an additional layer of protection. Technology is delivering this functionality now. It is a matter of when not if this happens. The re-engineering of valuation and property risk management is now upon us and lenders and surveyors are no longer immune to the impact that technology innovation can have on managing risk. The same mobile systems that help us order our shopping, buy our books, do our banking, are a part of own working lives. They will bring challenges to our models and our way of thinking. So the question has to be asked. Do we behave like Apple or like Kodak?